If you’re like me, you’ve spent more money than you care to tally on leather goods related to your horse obsession. You may be a member of the “my saddle cost more than my horse” club (as I have been). Or you may have more saddles than you have horses (as I still do, even having gotten rid of a few saddles in the last few years). Maybe you have a nice stash of unused tack that might come in handy one day (and you’re right, it might — a well-constructed drop noseband is hard to come by these days). Maybe you have no idea what’s even in the stash of unused tack you own. Having just recently become reacquainted with my own stash, I know it includes a Portuguese bridle for my fantasy Lusitano as well as an assortment of white cloth girths (perhaps my most insane purchase ever). If you’re like any normal horse person (which practically defines you as abnormal), you have more tack than you can use (or remember). You might as well start a leather care collection, too. Or, if you’re the frugal type (and if you are, I have no idea why you’re reading this), you can wait until you’ve used up what you’ve got and then try the items I’m going to recommend. Like Akene. I got my first tub when I bought a new Butet jumping saddle. Just slather it on stiff leather, leave it overnight and voila! soft and supple it is. If it’s a really hard case, slather it on for two nights in a row. It can save old tack you’d otherwise toss (unless you see cracks, in which case, definitely opt for tossing.) Even though Akene is glycerine-based, which I generally don’t care for, there’s no better product out there for softening up old leather. Since it seems as if nearly every leather care product today is glycerine-based, you may be wondering why I’m not a fan. It’s because I’m not a fan of mildew. Glycerol, one of the components of glycerine, is a traditional growing medium for fungus (what we call mildew are, in fact, fungi). The very quality that makes glycerol such an excellent growing medium — its ability to retain moisture — is the same quality that makes glycerine such a terrible choice for tack. Once your tack becomes a petri dish for mildew, it’s hard to eradicate the bloomers, but one set of products will do just that. It’s a system from Bee Natural Leather Care. Start with the Saddle Soap. This is no ordinary saddle soap. It’s serious, deep cleaning saddle soap, and shouldn’t be used more than once or twice a year. I’ve used it to transform ebay purchases from unfortunate to fortunate (including a black Kieffer Wien that was covered in black shoe polish). Follow with Rudy’s Tack & Saddle Conditioner and Finish. And finish one more time, with #1 Saddle Oil with Fungicides. 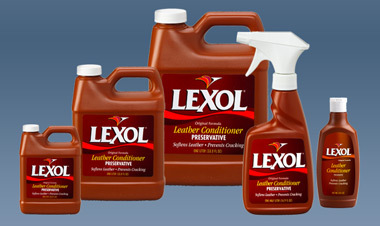 For more minor rejuvenating, there’s nothing like Lexol. It’s so easy to use – wipe it on, wait a minute, wipe dry — and it gives a beautiful glow to all your leather. 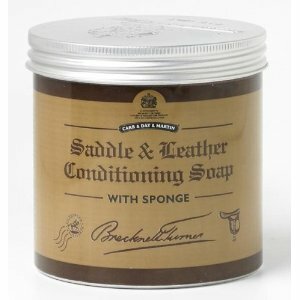 For day-to-day cleaning, I recommend Carr Day & Martin’s Brecknell Turner Saddle & Leather Conditoning Soap with Sponge. It’s creamy and beeswax based, and guaranteed never to make your leather limp, slimy or sticky (like — need I say it? — those glycerine-based products do). 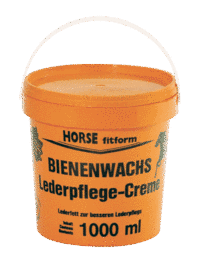 If you want to protect your leather not just from microorganisms, but also from scratches, boot rubs or dirt, an occasional application of Bienenwachs Lederpflegecreme from Germany’s Horsefitform is just the ticket. And you don’t have to have a horse named Donnerwhatever or wear full seat breeches to appreciate it. 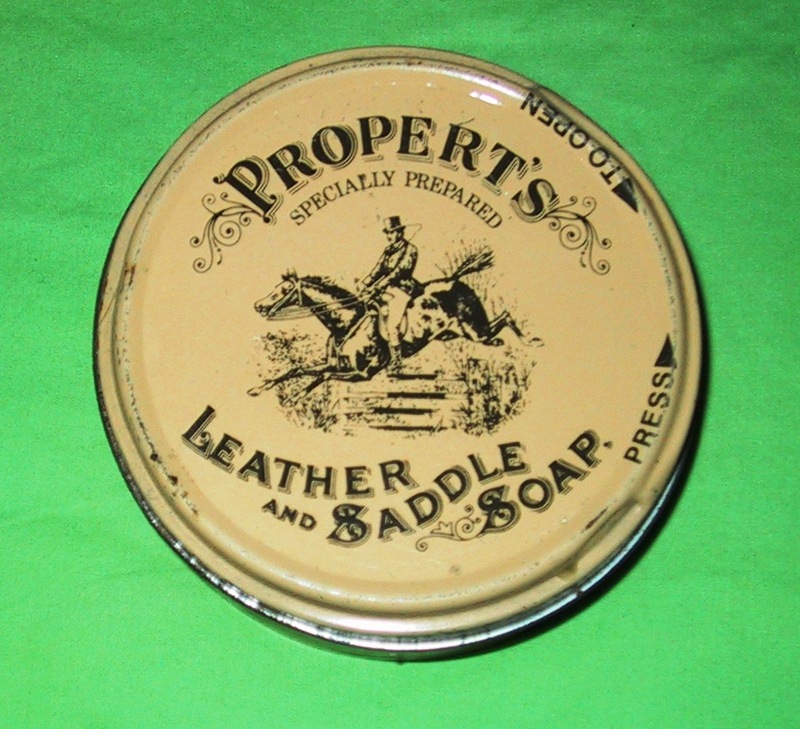 I would have added Propert’s to my library of leather care but I don’t think it’s made anymore. The closest thing I could find is the Brecknell Turner. If you’re old enough to remember Propert’s, maybe this will bring back memories. I’m sentimental enough to have kept an empty tin, just because I love it.